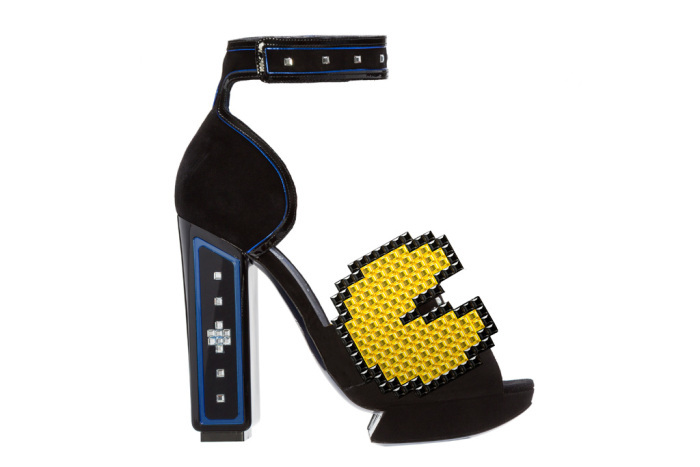 Shoe designer Nicholas Kirkwood has released a special, limited-edition collection inspired by his childhood of toys, TV and arcade games. Kirkwood grew up in the ‘80s and translated memories of “Star Wars,” “Back to the Future” and Pac-Man into such fun, creative details as square crystals, laser-cut pajettes and glow-in-the-dark shoelaces to decorate the shoes that are based on his trademark styles from the past 10 years and feature his signature platform. Blue suede with luminescent foil detail and luminescent laces. 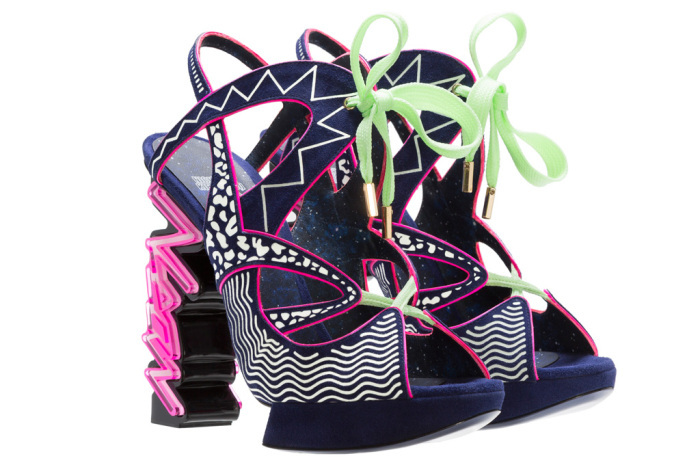 Black acrylic glass heel with luminescent ‘Neon’ motif insert. Kirkwood has only made a limited number of shoes in the “10” collection that are priced between $2,700 and $6,900, and will be available for pre-order at the Kirkwood pop-up at Selfridges Saturday during London Fashion Week, then traveling to trunk shows around the world. If the shoes are a bit out of your price range, Kirkwood will also have iPhone cases and totes as part of the collection. Black suede with black patent border and electric blue, foiled kid trim. 6mm square cut tinted crystal and jet Pac-Man. Lacquered black heel with acrylic glass marquetry insert. 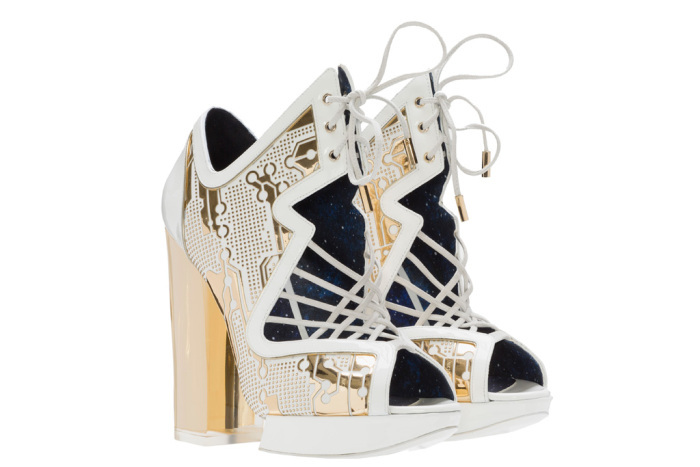 For more information, visit nicholaskirkwood10.com. Gold laser cut acetate bonded to off white neoprene with off white patent border and suede laces. 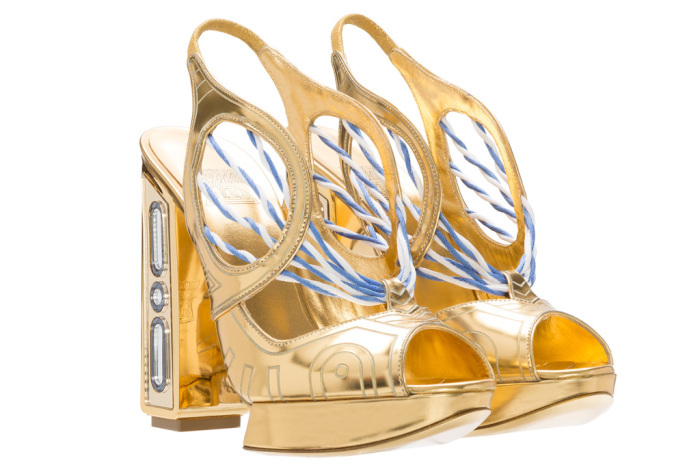 Mirrored gold acrylic glass heel. Hand tinted engraved mirror calf with twisted satin ‘electrical wire effect’ stringing detail. Chromed heel with acrylic glass marquetry insert. Grey kid cut through with foiled black metallic kid detail and rubber wings. 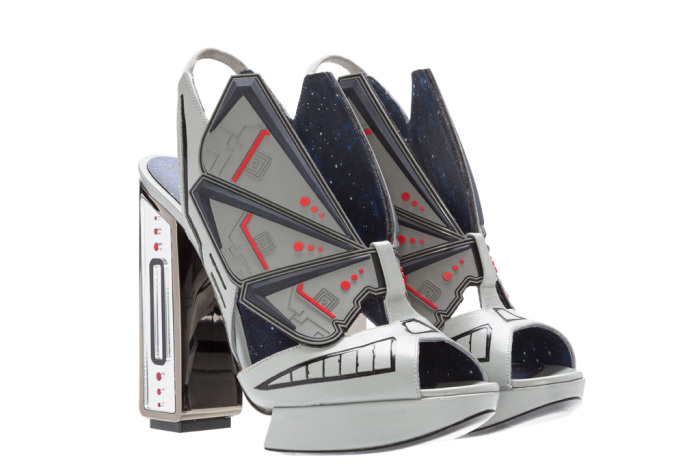 Gunmetal chromed heel with acrylic glass marquetry insert. Embossed red metallic sheen patent calf with silver mirror profile trim and red, foiled kid insert. Stretch neoprene and taffeta fused technical fabric with patent and grosgrain trim and moulded silicon cage detail.